Last month, I was approached by Fashion World to take part in a fabulous bloggers’ challenge. We were asked to pair their fantastic new Legroom ‘Wear Two Ways’ Boots with some jeans and to show how the boots work with different outfits. The fab Legroom Wear Two Ways Boots are absolutely ingenious. 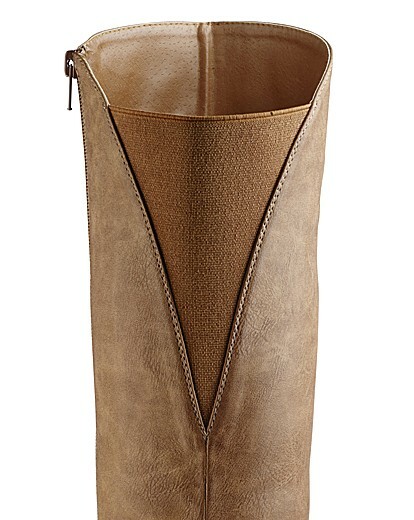 They look like regular knee high boots – and pretty fab ones at that as they feature an elasticated back panel to allow for wider calves (like mine!) 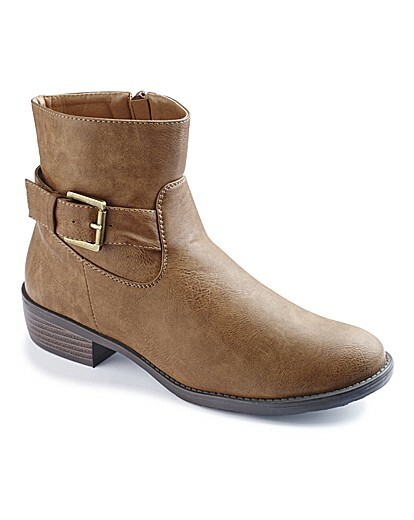 – but with a quick unzip and unbuckle at the ankle they are converted to on-trend ankle boots! How clever are these? I was so excited to read about them and even more so when they arrived at my house a week or so ago. The boots come in black and tan and seeing as I have very few brown/neutral items in my wardrobe I went for the black. 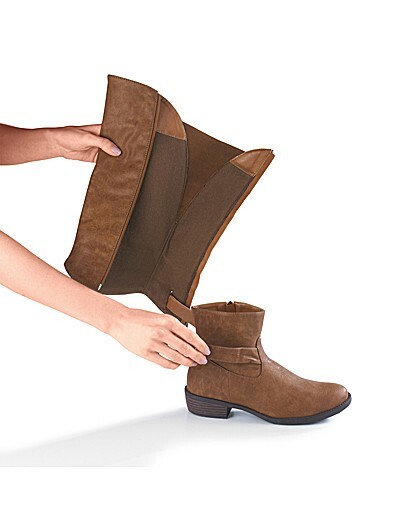 The Fashion World Legroom Wear Two Ways Boots come in two width fittings – standard and curvy – and two widths – E and EEE. I initially opted for the 6E Curvy Calf but have since swapped them for a 5EEE as I found the 6 a bit too long for me. I was also allowed to choose a pair of Fashion World jeans as part of the outfit. Having tried the Peaches High Waisted Slim Leg Jeans a while ago I went for them again as I knew the fit was pretty good for me. I will fully review these jeans in a separate post at a later date. The pair shown here are a size 16 but I have returned them for an 18 as I think the fit will be better. So, our task was to show the boots working as knee high boots and as ankle boots. If you’re a regular reader of my blog you’ll know that I wear dresses all the time so the notion of jeans with boots was quite a novelty for me and I couldn’t wait to see how the looks turned out. 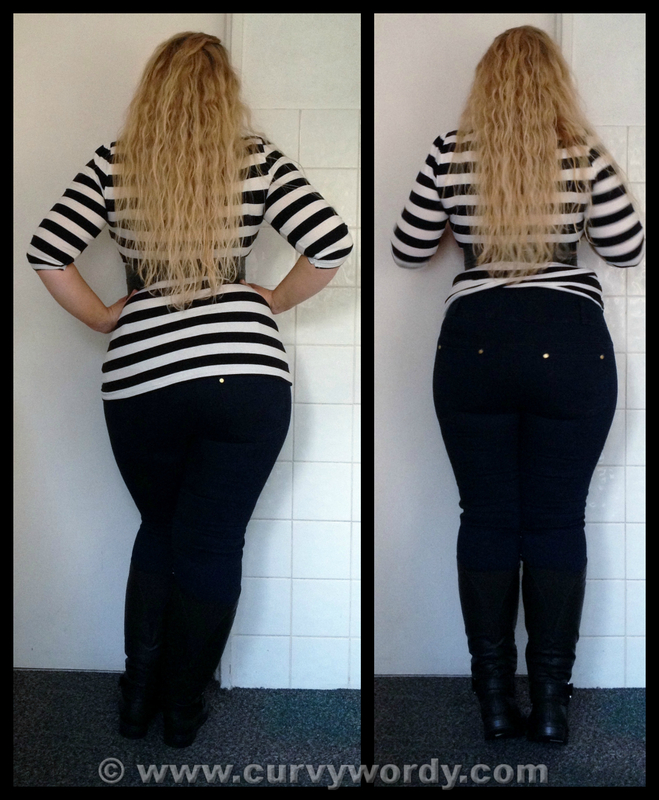 I paired the boots and jeans with a fab black and white striped top from Peacocks. It’s no longer available as I got it 3-4 years ago but I love the stretchy jersey fabric. The top is a bit big on my waist so I added my favourite Forever 21 belt with its super cinching power to highlight my waist. Perfect! And of course underneath I am wearing one of my Ewa Michalak bras – on this occasion it’s the PL Ametyst 30L/65L. 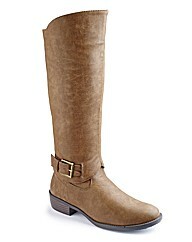 And what about the boots in ankle style? They work well! I do think this outfit would have looked better with the jeans in black instead of indigo but I think it still looks good. 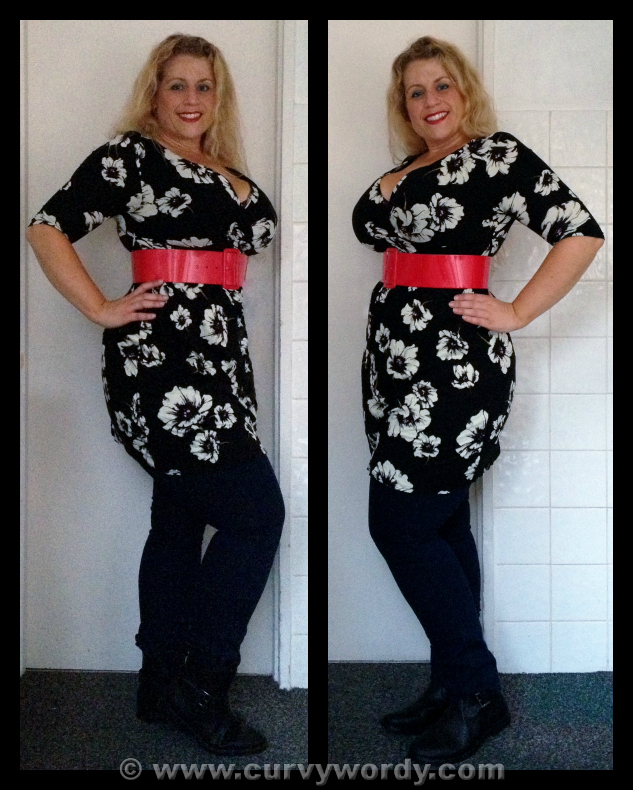 The top/dress is from Wallis last year and as I so often do I added a belt to cinch my waist. This is a red patent leather belt from eBay and it adds a bright pop of colour to my outfit. Now, on to the fit of the boots. They are great. I initially tried them on with bare legs and I was delighted to see how easily the Curvy Calf fitting zipped up over my chunky 18″ calves. When I tried them again with the jeans underneath it was a snug fit but as you can see I got there in the end and I was pleased to discovered that they didn’t feel tight on or as if I was cutting off the circulation to my legs or anything. As previously mentioned, the 6E were a bit long on me but the 5E turned out to be much better. I find I can size up in ‘closed’ shoes and boots as they are more forgiving when there is a bit of extra room, whereas in sandals and ‘open’ shoes I invariably have to size down. Thankfully, Fashion World’s superb choice of width fittings mean I don’t have to size up for width and I can go for the size that actually fits the length of my foot. The heel on these boots is pretty small at around 1″. That makes these boots incredibly comfortable to wear and perfect for any occasion when you either need to do a lot of walking or spend a lot of time on your feet. In my job I have to do a lot of both so these boots are ideal for me. They’d also be perfect for a shopping trip – no chance of achy feet in these babies! The boots are made from an imitation leather and feel like they are very good quality. I always treat any autumn/winter footwear with protector spray to provide them with a waterproof layer and to extend their life so I will definitely be doing so with these. I have often admired the jeans/knee boots combination on others and it’s great to have a pair of boots that can work for me in this way. Fashion World are running a competition on their Facebook page for people to vote for their favourite ‘blogger outfit’ so if you like my looks please head over there and give my picture a ‘like’. Thanks in advance! These boots are fantastic! I have calves around the same size as yours and I always struggle to find boots that fit comfortably so these look like a great option. And I love how they are convertable – such a simple idea but so clever. Cant wait for your jeans review. You have such a great sense of style. I love reading your blog posts because you always give me inspiration to try something new and different – thanks for that! I would never of thought about giving boots like this a try but you rock them so much that I have ordered them in both colours. Well done to Fashion World on having something so versatile available for plus size women – we love fashion and looking good too!